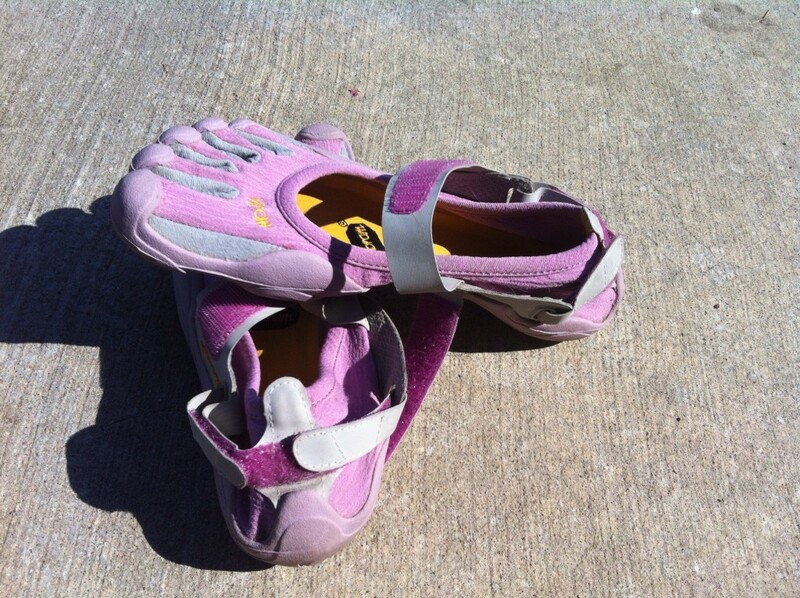 Have you ever seen someone where those funny looking fivefinger shoes and wonder why they wear them? Well, it’s time to get with the barefoot running program! In recent years, barefoot running or running in minimalist shoes has become a popular trend. So what’s the hubbub over this barefoot running trend? Since this is a fairly new phenomenon, there isn’t a lot of scientific evidence to support it. However, some experts suggest that running injuries could be greatly minimized by the barefoot running technique (And I agree). Over the years our bodies have become accustomed to wearing the modern day shoe (with a thick cushioned heel), which ultimately changes the mechanics of how we walk and run. Making the transition from shod to barefoot running is more complicated that just deciding to take your shoes off one day and deciding to go for a run. Do your homework. Understand the benefits,biomechanical differences, and the preparation that the transition takes and decide for yourself if it sounds like a good idea for you. From an evolutionary perspective, barefoot running is as natural as barefoot walking. Humans have been running long distances for many millions of years; most of that running was done barefoot on hard, rough surfaces. It was only in the 1970’s that the modern running shoe with a cushioned heel, arch support, and stiffened sole was invented. Logic would lead you to believe that with the advancements in technology and design of running shoes, that running injuries would be at an all time low. However, the very debate over barefoot running is fueled by concerns from runners, shoe manufacturers, and the sports medicine community about the high prevalence of running injuries present today. Depending on the source,between 30% and 70% of runners incur running-related stress injuries per year. Proponents of barefoot running (including myself) site the change in foot strike mechanics as the main reason why barefoot running could help prevent common running injuries such as plantar fasciitis, shin splints, and IT band syndrome. The following table outlines the key differences between the techniques. The most notable difference is the change in foot strike. Running in shoes forces the foot to land more on the rear-foot (heel) because of the thickness of the heels of shoes. With barefoot running, foot strike when landing is focused more on the forefoot and mid-foot allowing the body a greater ability to dissipate forces from the ground to the leg more evenly. Making the transition from shod to barefoot running should be made over a gradual time period of ATLEAST 4-8 weeks if not longer. The primary reason for this time frame is that muscular adaptation to training resulting in strength gains requires at least this time frame. An evidence-based preparation program should target exercises that address the key biomechanical differences between shod and barefoot running. These key differences include: Plantar sensitivity adaptation, foot strike pattern, stride rate, stride length, lower extremity proprioception, ankle joint flexibility, intrinsic foot strength, and eccentric (the muscle lengthens under tension) strength of the lower limb to control impact forces. The table below outlines some easy activities to aid in a safe transition. A great intrinsic foot exercise is the short-foot exercise. In a single-leg stance, attempt to draw the forefoot (base of the toes) closer to the heel. The key is to think about pulling from the base of the toes, not the toes themselves. Avoid toe curling. Making the transition to barefoot running requires patience and planning. Expect some soreness throughout the transition because you will be utilizing different muscles with barefoot running. But, as when starting any training program, always listen to your body. Don’t increase your distance if your soreness persists longer than expected. Consult your physician if you experience pain beyond soreness. Check out the sample progression below. The program can always be adapted to your specific needs. Whether you’re looking to prevent running injuries, improve your athletic performance, or just want to try something new, barefoot running is a great place to start. Be patient and properly prepare your body for the transition. And as always, if you have questions or concerns, be sure to ask a knowledgeable strength training or health care professional. Rothschild, Carey. “Running Barefoot or in Minimalist Shoes: Evidence or Conjecture?” Strength and Conditioning Journal.Volume 34. Number 2. April 2012. This blog post was submitted by Brad McCleary, an ambassador for the track club. It was written by Nicole Dierking who gave permission for the club to post on our blog. Nicole is a local personal trainer and chiropractor.